I’ve finally found my Mojo. No, not the Austin Powers kind, but the saucy citrusy kind that originates from Cuba. It’s pronounced “mo-ho”, not “mo-jo”, the libido giving force made popular by shag carpet-chested Mike Myers, so you shouldn’t get too many strange looks when you tell people what you had for dinner as long as you say it right. Mojo is a tangy sauce made of citrus, garlic and traditionally lots of oil; though I’ve made a healthier version here with less oil and a welcome addition using my favourite fruit, mango. I love mangoes; I eat them dried, candied, juiced, frozen, in sorbets, and have even had them freshly fallen from a tree. From the small house in rural Thailand where I lived one summer, I remember hearing periodic bangs on the corrugated roofs of neighbours, which marked the sound of ripe mangoes being shaken from the trees by hungry children with long wooden sticks, clamouring for dessert. This sauce is a delightful accompaniment to grilled pork, prawns or fish. I picked up tuna flank from the grocer this afternoon and marinated it in herbs and oil before sauteeing it very briefly, slicing and then serving with a generous drizzling of mojo. My Cuisinart food processor has been getting a lot of action lately. With it I’ve discovered the splendours of homemade marinades and sauces by wildly pulsing together ginger, garlic and lemon juice with other random ingredients lurking in the recesses of my fridge. 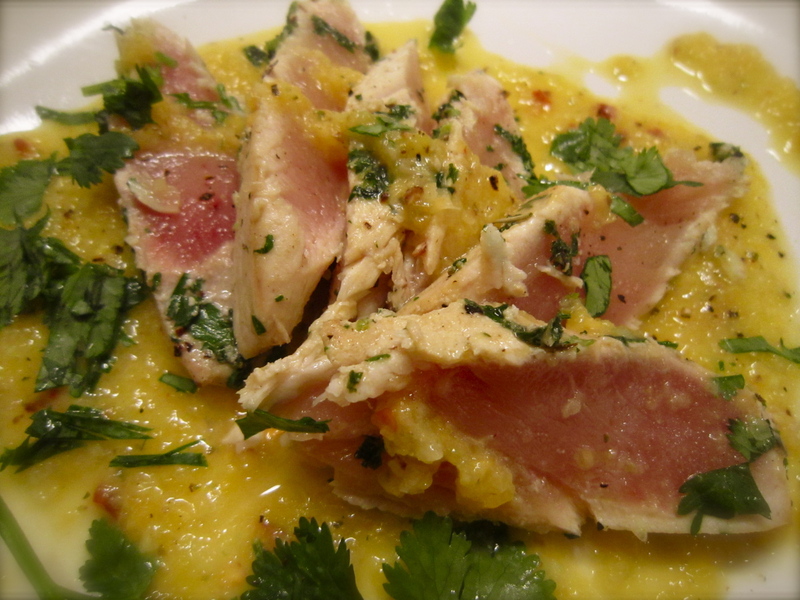 Last night I made a zesty, Cuban-inspired mango mojo sauce with grilled tuna flank, by pureeing mango with lemon, orange juice and hot pepper – Muy bueno! 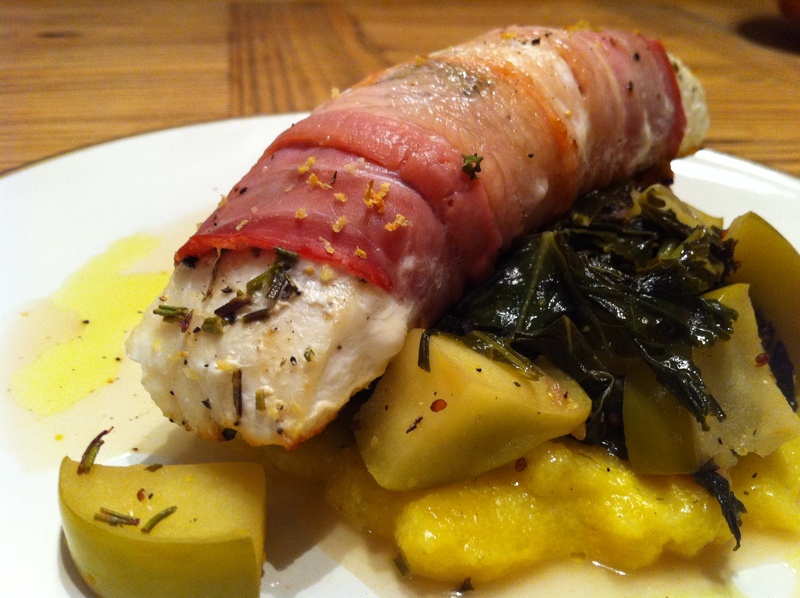 Tonight, I’m searching for inspiration from the sea once more with this dish. 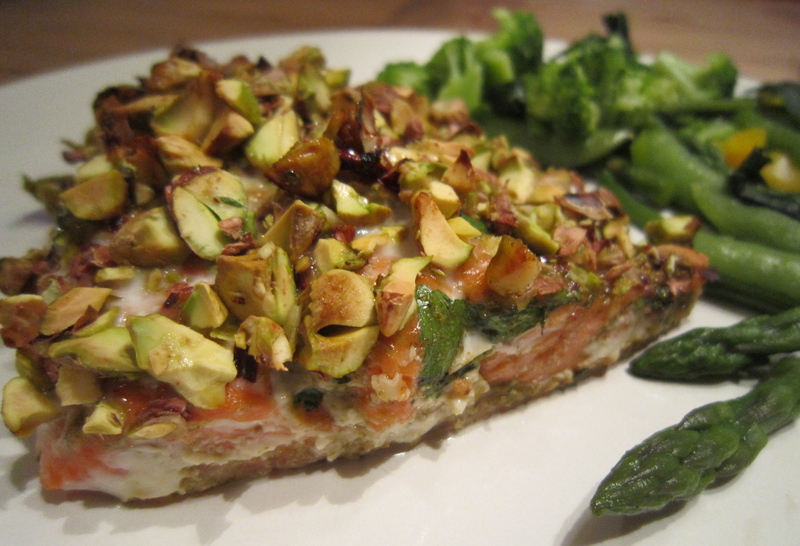 It combines some of my favourite ingredients: salmon, maple syrup, pesto and pistachios. The pistachios have been beckoning me from the bottom shelf of my cupboard for a few months and although I originally intended pairing them with halibut, I couldn’t resist the beautiful and fresh salmon fillets that were on sale yesterday. Enjoy! I was digging around some old photographs yesterday and came across a photo of a family halibut fishing trip from 3 years ago. It was the first time I had ever gone fishing, unless you count the time at Montreal’s Atwater Market when I was really young, where I hooked a trout from a tank with a toy rod. The halibut experience was different, needless to say, and more thrilling than a plastic pool of water and a Bugs Bunny reel. I had never seen a halibut outside of a grocery seafood section, so was surprised and a little mortified when a massive, prehistoric-looking beast latched onto our line off of Vancouver Island. I felt like Quint from Jaws on board the Orca and the fish’s violent thrashing on the surface had me jokingly humming the dramatic “dah duh, dah duh,” much to the annoyance of others. It took two grown men (while I watched) to slowly reel the creature aboard. From that fishing expedition I had nearly a year’s worth of frozen halibut. After six months, my appreciation for this “chicken of the sea” was waning from over-indulgance, so I started giving some away to friends or bringing large slabs of fish to BBQs. I haven’t caught any fish since, but my appreciation for halibut has been renewed.